From the Telegraph in the United Kingdom comes this bit of news. The research by the University of Newcastle found vets spend half as much time treating farm animals as they once did ten years ago. Instead all their time is taken up treating sick cats and dogs because it pays better. 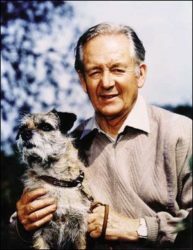 The study warns that vets like James Herriot, who became famous after his book All Creatures Great and Small became a best seller and was made into a television series, are a thing of the past. Next PostNext Welcome to JamesHerriot.org!